LCD Soundsystem doesn’t just make music; they make music about music. The group has made a clever kind of sampling-by-way-of-interpolation their calling card, and many of their songs reference the rich history of dance music from the ’70s to the present day. Sometimes these references are less pronounced, and at other times they’re almost like covers or reinterpretations. But no matter how they’re presented, they’re almost always delivered with a knowing wink to the listener. Now, on the eve of the release of the band’s new album, American Dream, we took a look at some of the more notable references the group’s made over the years. This song is pretty much entirely about references. There are shout-outs to the first Can show in Cologne, to Larry Levan’s Paradise Garage, to Basic Channel, to Faust, Manuel Göttsching, The Swans, Juan Atkins and to Daft Punk. In fact, it famously breaks down halfway and turns into an incredibly memorable name-dropping extravaganza, in which Murphy emulates Afrika Bambaataa‘s hype patter in “Planet Rock” when he drops a knowing “Just hit me!” Less obvious, though, is the rhythm of the song itself, which recalls the minimalist lo-fi computer rhythm of Killing Joke’s ’80s B-side, “Change“. This is one of the band’s most incendiary live songs. There are many references hidden inside this track, but one of the most immediately obvious comes in the form of the charging disco rhythm that echoes the crisp, snappy playing heard in another extended-length dance classic: The Trammps “Disco Inferno“. This can be heard in the thumping bassline and in the straight-up Philly-style four-on-the-floor bombast. This song may well have officially kicked off James Murphy’s Kraftwerk fixation. “Disco Infiltrator” leads with the funky and strobing synth line from “Home Computer“. More than just simple sampling, “Infiltrator” creates a whole new song from a riff, and it still stands alone as one of the best 12-inch singles from the early-’00s dance-punk movement. This was LCD Soundsystem’s Suicide moment. Though there are no actual direct references, this song brings to mind two other works almost immediately: the minimalist rhythm is a nod to “Ghost Rider” by legendary New York no wave band Suicide, and the vocals are styled to sound like the ranting and raving of The Fall’s Mark E. Smith on “Telephone Thing“. LCD Soundsystem often lean on synth-pop, no wave and post-punk sources, so it makes sense then that they’d reference a group that embodies all three of those things. “Thrills” is their homage to The Normal’s synthwave classic “Warm Leatherette“, and what an homage it is. 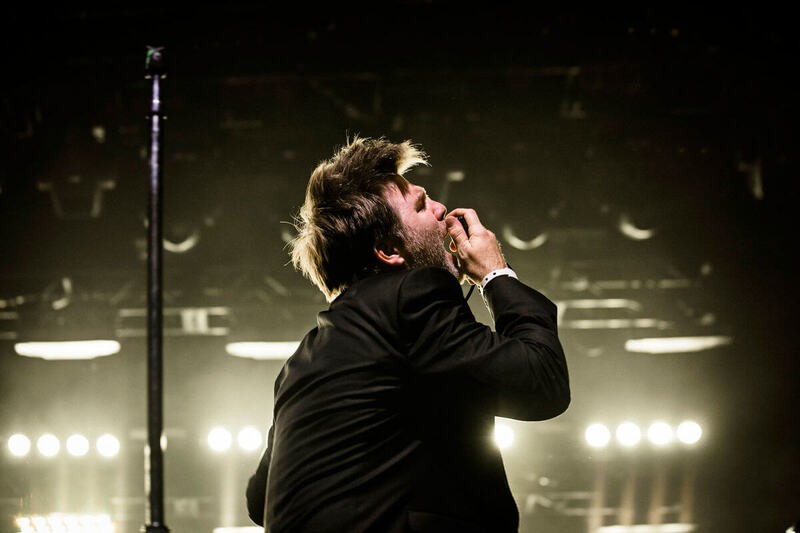 The stop-and-go rhythm, the abrasive synthwork and Murphy’s own vocals show that LCD also knows how to get gritty. LCD Soundsystem’s second studio album, Sound Of Silver, begins with a fairly obvious reference to Kraftwerk‘s “The Robots” on “Get Innocuous!”. Though you might immediately assume we’re talking about that hissing mechanical rhythm that serves as an intro, the truth is that it’s actually the chunky, arped-out bassline. The overall effect is a tip of the hat to the legendary Düsseldorf outfit in the form of creative reinterpretation. Anyone who’s heard James Murphy DJ knows that the man is extraordinarily fond of Macho’s extended-length mid-’70s disco epic, “I’m A Man“. What makes that song so effective in clubs is its extraordinarily long hard rock drum solo. Considering the track has been a fixture in Murphy’s sets for a long time, it makes sense that he would point to it on “Freak Out!”. The first song on This Is Happening goes a little deeper than other LCD cuts. Rather than lifting from or referencing famous artists, the synth rhythm that leads the song is lifted wholesale from The Pool’s ’80s cosmic disco classic “Jamaica Running“. The track is considered one of the classics from Cosmic, the pioneering Italian club that counted Danielle Baldelli as its resident selector and birthed cosmic disco as we know it today. You can hear a mix of cosmic disco sounds in Baldelli’s mix for EB.Radio.